As I've shared before, we love decorating for holidays and different seasons. Our house is in a crazy transition stage right now since we are going through a remodel and everything is dusty, dirty, and out of place. To help us feel better and get in a Spring-like mood, we decided to make some spring wreaths! I have an overabundance of craft supplies, so instead of buying anything new, we rummaged through our craft cupboard and got out a variety of random materials and started creating! Creating a wreath making station is simple! We did a similar wreath activity at Christmas time (that we shared over at KidsActivitiesBlog.com) and it was also a hit. 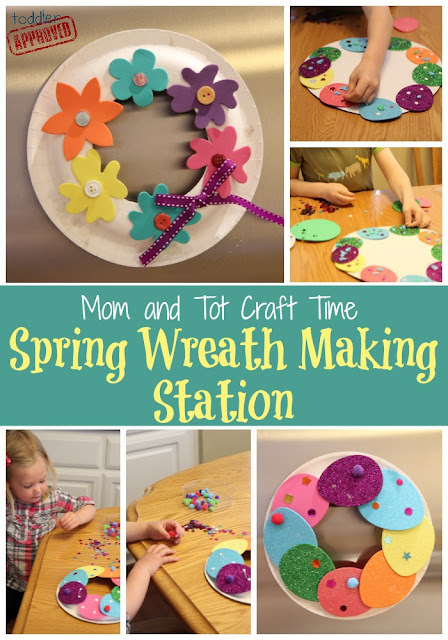 To create a Spring wreath making station you need a variety of materials, a spot to lay everything out where everyone can reach all of the supplies, and a base. We love using paper plates as our wreath base, but we have also used styrofoam wreaths. Both are great. Other materials that would be fun to have could include tissue paper, scrapbook paper, fake flowers, and beads. 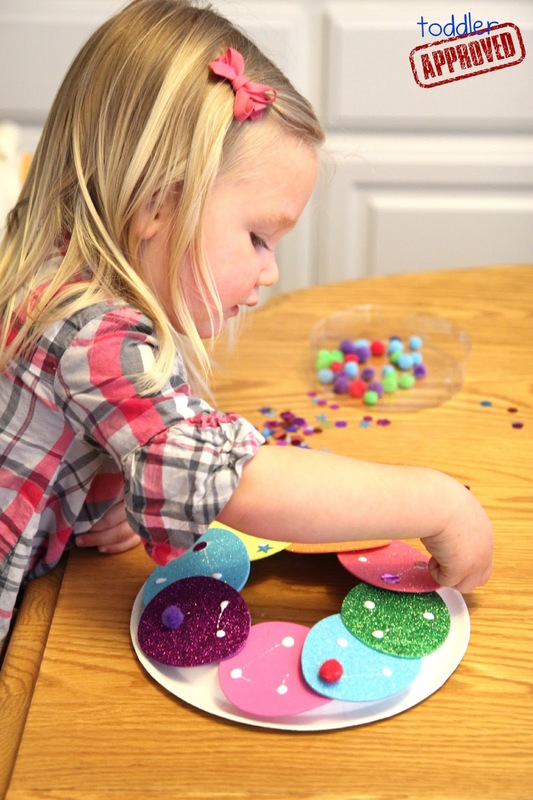 Once all the materials are laid out, give your child some glue and let them start creating! My 5 year old is very comfortable with glue and my toddler still asks for a lot of help, so sometimes she tells me where to squeeze the glue and I put it on for her. I like to take turns with her though because squeezing glue is hard work and great for building her finger muscles! During this activity we talked about colors, shape, and sizes. Using little buttons and little shaped sparkly confetti pieces required my toddler to use her fingers a lot to pinch and pick up. This was great fine motor skills practice for her! Do you decorate for Easter or Spring at all? Do you ever make wreaths for holidays? What other Spring or Easter crafts are you making right now? Who doesn't love sparkles! I bet this would even get my 6 year old to put down his Legos and join in - I'll have to give it a try tomorrow!! LOVE this, I have so many paper plates to use up!